The theory and applications of ab initio methods for the calculation of molecular properties are reviewed. A wide range of properties characterizing the interactions of molecules with external or internal sources of static or dynamic electromagnetic fields (including nonlinear properties and those related to nuclear and electron spins) is considered. Emphasis is put on the properties closely connected to the parameters used to describe experimentally observed spectra. We discuss the definitions of these properties, their relation to experiment, and give some remarks regarding various computational aspects. Theory provides a unified approach to the analysis of molecular properties in terms of average values, transition moments, and linear and nonlinear responses to the perturbing fields. 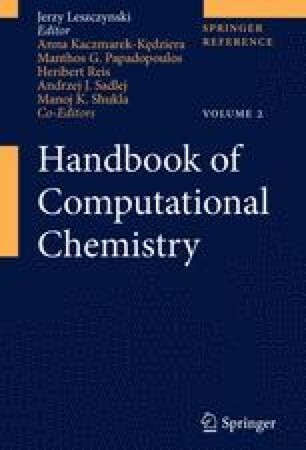 Several literature examples are given, demonstrating that theoretical calculations are becoming easier, and showing that computed ab initio molecular properties are in many cases more accurate than those extracted from experimentally observed data. We are grateful to Dr. Stephan Sauer and to Dr. Olav Vahtras for many helpful comments. We are indebted to Dr. Anna Kaczmarek-Kędziera for help in the editing of the manuscript.